It started out on Friday, November 30 at Christchurch’s Woodford Glen Speedway with a line-up of 24 saloon drivers - eight from the North Island and 16 from the South - competing in the six rounds, one week Holden Trade Club Saloon Speedweek presented by Valvoline. How many will last the distance is anyone’s guess, but what’s for sure, the finale at Heavy Trax Hire Central Motor Speedway on Saturday, December 8 will be a thriller under the mountains. Low, wide and powered by carburetted, petrol fuelled V8 motors churning out around 400 horsepower, speedway saloons are thoroughbred racers. Beneath fibreglass body panels replicating American muscle cars is a sophisticated space frame chassis and ‘Born in the USA’ shocks, brakes and other components. If all goes to plan, four Heavy Trax Hire Central Motor Speedway ‘t’ drivers, Ivan Murdoch(7t), Phil Burgess(15t), Graham Williamson(21t) and Barry Taylor(28t), will be at the pointy end when the green flag drops at 6pm on Saturday, Dec 8 at Heavy Trax Hire Central Motor Speedway. Adding to the evening's fast and furious action are some nine V8 Modifieds competing in round 1 of the Mainland Modifieds Series. These winged beasts were introduced to New Zealand in the 1970s and despite competition from sprintcars are considered to have held their own, although one small mistake and they can roll along the dirt like metal tumbleweed. 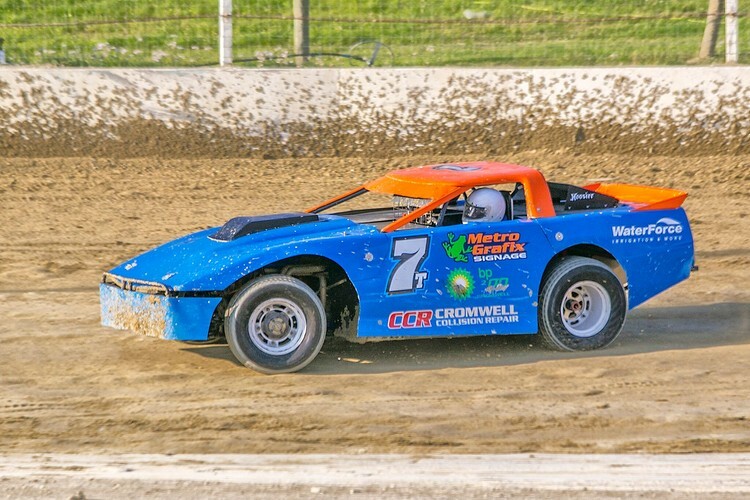 Modifieds are lightweight space frame open wheelers with a huge down-force wing that as driver Andrew Naven, who will be on the Central Otago clay in 69c, suggests makes them look like a sprintcar but with bodywork of a saloon. All modifieds racing at Cromwell have methanol fuelled V8’s putting out some 635 horsepower. Support classes such as six shooters, productions and youth ministocks will will also be racing. As a footnote, for a number of reasons that would prevent the Central Motor Speedway from putting on “Central Otago’s Fastest Family Show on Earth”, the Saloon Showdown previously advertised for Sunday, December 9 has been cancelled. But Saturday alone should have everyone going home suffering OES (Over Excitement Syndrome).